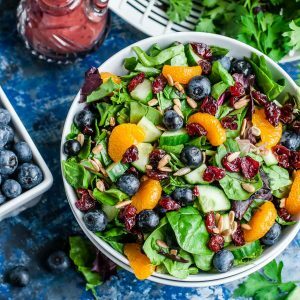 I'm head over heels in LOVE with this healthy Cranberry Blueberry Salad with Blueberry Balsamic Dressing! This scrumptious Summer salad is fun, fruity, and full of flavor! First make your dressing: In a food processor or blender, combine all dressing ingredients except for the avocado oil. Blend until blueberries are completely pureed, then use the little top cut-out to drizzle in the avocado oil at the end. Once dressing is emulsified you're good to go! Wash + dry your greens. Combine with cucumber and blueberries, then toss with a drizzle or two of dressing. Add extra as desired. Top with mandarin orange segments, dried cranberries, and sunflower seeds and serve! Making this salad in advance? Go for it! Mix together everything minus the orange and dressing then combine when ready to serve! NOTE: This recipe makes a bottle's worth of dressing which will keep great in the fridge for future salads. Only want a little? Feel free to halve the recipe!